During the lifespan of the NES, there were many different companies trying to get their hands in on making controllers and different peripherals for the system. While there were many different options for replacement controllers or controllers that offered more features, it seems Nintendo always had the edge over the competition, at least in my personal opinion. Nintendo only released 4 main controllers (not counting the Zapper or the “Its so bad” Power Glove), and those are what I will be examining today. Almost all of us started out with the standard NES controller. That rectangular hunk of plastic with it’s simplistic design, but was fully functional for any NES game you wanted to play, and later it would be redesigned into a more rounded off (SNES-ish/dog bone) shape. 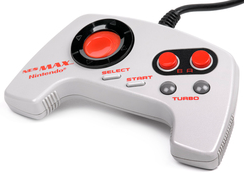 Then perhaps you may have also had the NES Max, a futuristic design with handles at the bottom and finger rests on the back that also featured turbo buttons along with an odd and oftentimes hard to use D-pad. Last and certainly not least there was the NES Advantage, this thing was huge in size all around and made you feel like you were turning your NES into an arcade machine! The standard NES controller offered the bare necessities you needed to play any game released for the NES. Unlike the more rounded off Famicom controller, if you didn’t learn to hold this controller just right you would often hurt your fingers, and if you wanted more than standard reactions from A and B, there was a lot of button mashing needed to be done! One thing Nintendo did do right with the NES over the Famicom was giving the cables more length and allowing for the controllers to be interchangeable, in case one was damaged. Sporting a more rounded off shape (aka dog bone), this controller featured the same standard controls as the rectangle, but this time in a more comfortable, smaller design. To accent the rounded off design the A and B buttons were set in at an angle, as were the start and select buttons, to offer a more SNES controller feel. 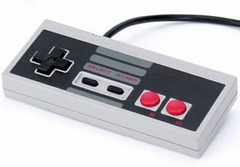 The cable is about 3″ longer than the standard NES controller and the D-pad is substantially larger. These controllers can be hard to find as they were released with the NES 2 (aka top loader) and are naturally harder to find than the rectangles. There are 3rd party copies of these controllers available today, but I would prefer the Nintendo brand, personally. As I mentioned before, this controller has handles and finger rests possibly making it the most comfortable NES controller ever released. Introducing turbo buttons was a huge plus, but whatever they called the sliding D-pad featured on this controller really tanked the user friendliness overall. I think Nintendo was possibly looking to incorporate an 8 directional option, without using a joystick. You could still use the outer rim of the D-pad much the same as a normal D-pad, but it was only slightly less frustrating than the sliding button within it. If you can manage to use the D-pad without it sending you off in some odd direction, this controller would have been the best NES controller in my personal opinion. 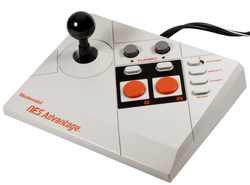 With it’s huge base, giant A and B buttons and it’s 8 directional joystick, the NES Advantage was obviously modeled to simulate the arcade controls of it’s time. The Advantage also offered a slow motion feature, variable speed turbo with individual dials for both A and B, as well as a switch to hand it over to player 2 for their turn. My assumption is the Advantage was intended to be placed upon a table or the floor and used, but sometimes I like to pick it up as if it were a standard NES controller and use it that way. There are some games the Advantage can enhance, mostly the NES ports of arcade games, while others are hit or miss whether this controller is useful or more of a hindrance to the player. I own all four of the above controllers, in fact I own two of each with the exception of the NES Max. Over the years I can say I have quite a lot of personal experience with each design. With the exception of the D-pad design on the Max being a little tricky, all of these controllers get the job done. Each controller has a different purpose to me. If I’m playing my NES and need some turbo buttons, I’ll use my Max. When I just want that nostalgic experience, I use the standard rectangle. Lately I’ve grown very attached to my redesigned NES controller because its very comfortable and sits right in my hands, comfort is important when you’re playing video games for hours at a time. Some 3rd party controllers have the more rounded Famicom design, but for whatever reason it just didn’t occur to Nintendo to make some for the NES. The official NES controllers have a sharp reaction that is difficult to achieve with other controllers, although not impossible. I own a lot of different controllers for the NES, both official and not, but there is just a certain feeling I get when I’m using Nintendo brand controllers with the NES.